COMMUNAL waste bins at Westfield were not emptied for eight weeks, despite constant complaints to the waste collection service. 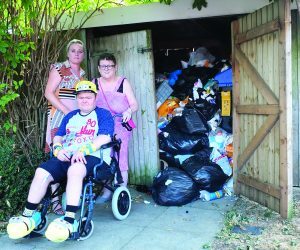 Rubbish was overflowing from the bin shed at Meadow View – until the News & Mail intervened. The shed was riddled with flies and starting to smell in the hot weather. The failure to empty the bins disgusted Jo Cameron, whose mother and brother live at No 19. “I reported the problem eight weeks ago and have been calling the waste collection helpline at least twice a week since then,” she told the News & Mail on Monday.